Congratulations to Scott Menary (Physics & Astronomy) on being part of the team that received over 6 million dollars in CFI funding for ALPHA-g: An apparatus to explore antimatter gravity with cold trapped antihydrogen. The project includes partners from University of Calgary (lead institution), University of British Columbia, and Simon Fraser University. The Science@50 public event, Dispatches From the Frontiers of Science, held at the Appel Salon of the Toronto Reference Library, drew a capacity crowd of 700 to hear Jane Heffernan (Mathematics & Statistics), Demian Ifa (Chemistry), Matt Johnson (Physics & Astronomy), Edward Jones–Imhotep (STS) and Sapna Sharma (Biology). Anna Maria Tremonti, host of CBC’s The Current, moderated the discussion. More than 160 people attended the Science@50 Gala, to celebrate the Faculty’s many successes and achievements over the past 50 years. Prominent journalist Piya Chattpoadhyay (TVO and CBC) served as the master of ceremonies. President Mamdouh Shoukri and Vice President Academic & Provost Rhonda Lenton joined the celebration. Past Deans and long-serving faculty and staff members were recognized with special awards and the winners of the photography contest were announced. Check out the FSc website for more details and photos from the evening. 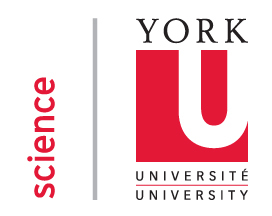 Every year the Faculty of Science organizes York’s participation in Science Rendezvous, and this year, with the weather on our side, the event was more successful than ever. Hundreds of kids of all ages, with their parents and grandparents, were streaming in and out of the Markham Farmers Market all day long. Many thanks to our student and faculty volunteers who engaged kids and adults in more than 30 science activities. Their enthusiasm and passion for science helped us showcase York Science in a very positive light. Check out the photo gallery. Roger R. Lew (Biology) is undergoing what he calls his “reincarnation” to Emeritus status, and has decided to create a student bursary. Like all of us, Roger has met his share of students who struggle to make ends meet, and the Roger R. Lew Bursary is a generous act to assist such students in future years. This new bursary will make $1,000 available to one student annually studying Biology, Biophysics or Biochemistry. The initial fund has now been invested with $10,000. Colleagues may support the fund as a tribute to Roger and his distinguished York career. Thank you for thinking of our students, Roger! Undergraduate student Jacob O’Brien, working in Chun Peng’s (Biology) lab, won first prize for his oral presentation at the Southern Ontario Reproductive Biology workshop held at McMaster. Jacob works on how miR-218 microRNA regulates placental cell gene expression. NOAA research chemist Steve Brown delivered the 2015 Harold I. Schiff Lecture, named in honour of the Faculty’s founding dean. Paul Delaney (Physics & Astronomy) gave talks at Science Rendezvous, DDO AstroNuts: What’s Up In Space, and the Canadian Astronomical Society annual general meeting, where he accepted the Qilak Award. Bridget Stutchbury (Biology) highlighted the importance of protecting the continental ‘bird nursery’ in a Toronto Star Op Ed. Jianhong Wu (Mathematics & Statistics) and Jean-Paul Paluzzi (Biology) were featured in a CTV News article, The Windsor Star, and on-air with AM 610 (Niagara) about the spread of blacklegged ticks in Canada and the potential threat of Lyme disease. Laurence Packer (Biology) and PhD student Scott MacIvor were featured in a Maclean’s magazine article about bee hotels. They also did 19 interviews across Canada through the CBC Radio’s syndicated audio unit, Radio Canada International, OrchardPeople.com, and the Entomological Society of Canada blog. Paul Delaney (Physics & Astronomy) was interviewed on Sirius XM radio about a luminous, old galaxy. Dean Jayawardhana’s work on exoplanet weather with his PhD student and former postdoctoral fellow was featured on the CBC, CBS News, The Weather Network and Daily Mail (UK). In case anyone is counting (thanks Monique Golding! ), there were over 60 mentions related to the Faculty of Science in YFile last year (May 1 to April 30).